Carrie L. Dul, M.D. began her career in medicine as an R.N. completing her undergraduate degrees in psychology, biology and nursing science at University of Michigan-Dearborn and Wayne State University with highest honors. 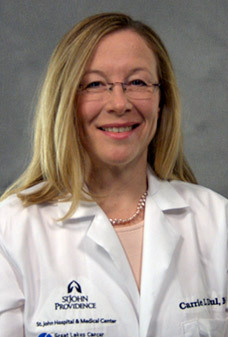 She attended University of North Carolina at Chapel Hill Medical School from 1995-1999. ... Read More She then went on to complete both her Internal Medicine Residency and Hematology and Medical Oncology Fellowship at Oregon Health and Science University in Portland, OR. She returned to the Detroit metro area to join Great Lakes Cancer Management Specialists in the Fall of 2005. She is certified by the American Board of Internal Medicine in the specialties of Hematology and Medical Oncology. Her professional memberships include the American Society of Clinical Oncology and American Society of Hematology and American College of Physicians. Dr. Dul has a strong interest in the care of breast cancer patients and women's health in relationship to oncology and hematology diagnoses. She completed special clinical training in breast cancer during her fellowship and established an active breast cancer practice. She has participated in clinical trials, written and given review lectures for community oncologists, patients and her academic community in thee areas. She has additional training in ethics and has served on the ethics committee during her residency and fellowship. She has been recognized by her peers for exceptional compassion in caring for patients with humanism award. She serves as the Principal Investigator at St. John Hospital and Medical Center for clinical cancer trials with the National Cancer Institute, Mayo Clinic as well as other national research organizations. She serves on the Board of Michigan Cancer Research Consortium which is a network of community hospitals engaged in clinical research. She is an advocate for continued research in oncology and participation in clinical trials. Carrie Dul, MD offers services at multiple MI locations.